The Job Centre – or Jobcentre Plus, as my local branch has been branded – is a now part of my life. It’s not the first time I’ve been through the doors of a job centre, I had a summer job in the Benefits Agency and our paths crossed from time to time. Being a dole bludger is not high on my list of aspirations, but when you have a mortgage to pay and food to put on the table £65 a week is £65 a week. And I’m claiming what is known as contribution-based Job Seeker’s Allowance, which means I have contributed enough NI Stamp to be entitled to six months’ worth of pay back – not bad for over ten years unbroken contributions. Processes have changed since my day – it is now possible to apply for benefits online. Once completed I was asked to attend an interview where I agreed a plan of action in a bid to get me back into work as soon as possible. I was now officially on the dole a Jobcentre Plus customer; officially just another unemployment worklessness statistic. Having a structured plan to help me find work would be useful, so I suggested that I check industry specific job sites on the internet every day to see what opportunities are available. It was nice to know they had faith in me. So that was agreed and my plan of action was in place. Carry on doing what I had already been doing – only do it slightly less often. There was no offer of any sort of help with my CV, no one told me where I could get help or advice on job hunting or interview techniques – this really was to be a literal and metaphorical box-ticking exercise. Fortunately I had already had my CV polished, but for many people losing their jobs after years in the same position their CVs would be out of date and in need of some work. I know plenty of people who have not updated their CVs in ten years or longer. being in the system means I sign on every fortnight, having kept a record of what I have been doing to look for work. I tend to lie on the form and just miss out the days when I have been looking for work when I did it on a day that wasn’t part of the agreed “every other day” regime. So far I have got away with it. Apart from the pretence I am perpetrating to my fortnightly adviser, I am also in a constant battle with the Jobcentre Plus bouncers security staff. These are a new(ish) addition to job centres. In days of yore staff sat behind toughened glass to protect them from disgruntled claimants customers. A few years ago the powers that be decided front-line staff in the benefits agency should be more open and approachable – it came during a major re-brand during which the DSS became the BA and claimants became customers. Needless to say this new approachability allowed a few violent nutters who were unhappy at being refused a payment because they had missed a couple signings through a heroin induced stupor to approach the staff in a physical way. So attacks on staff members increased. But to make sure the happy, open feel of job centres was not lost the physical barriers were not replaced – instead a bevvy of G4S security staff were employed to intervene in case things got hairy. Now most people visiting a job centre are there to sign on and that’s it, so the security staff have very little to do. Which is, I assume, why they create little jobs for themselves. Every time I go I am asked what I am there for, fair enough – if I said I’m there to buy tickets for a Michael Jackson concert they could provide helpful advice, letting me know he is dead and that even if he weren’t the Jobcentre Plus is not for tickets. But I tell them I am there to sign on – as far as I can ascertain, Jobcentre Plus’ raison d’etre. Instead of saying “fine”, they eye me suspiciously and ask me if I have my signing on book. When I tell them yes and go to move on they ask me to show them it, as if I am lying in order to sneak into the Jobcentre Plus. Maybe someone has done this in the past and they are just being vigilant – The question is why would anyone want to have an illicit visit to their local Jobcentre Plus?? 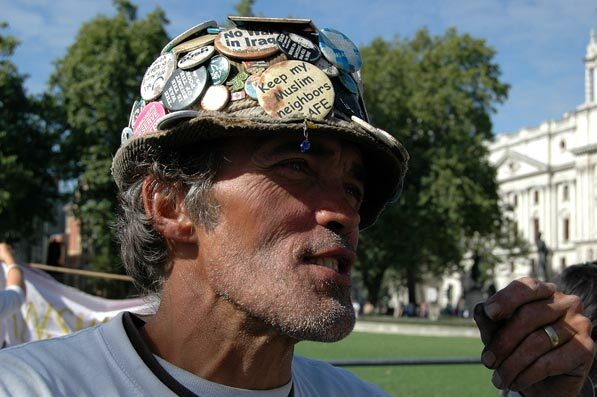 Two bits of news have jumped out at me over the past 48 hours – the death of peace activist Brian Haw (http://www.politics.co.uk/comment-analysis/2011/06/20/brian-haw-the-ultimate-protester or any number of other news sites) and a missive from the Daily Express (http://www.express.co.uk/ourpaper/view/2011-06-20) about the lack of summer holidays that will be abound this year. The two items neatly bookend the past decade for me. Ten years ago I was a raw recruit into the (un)glamourous, highly paid world of journalism. In actual fact this was just before I started an to earn the princely sum of £10,500 in my first reporter’s role. I was in the enviable position of having forked out some £5,000 to learn my trade. One of the first assignments was a trip to the big city where we were to wander the streets searching for scoops. We started off with a trip round the Houses of Parliament. As that ended we were told to head out in to the mean streets of London Town and not come back until we had two top quality stories – before being reminded that the coach was due to depart at 5pm sharp. As a journalist you are always up against deadlines. Brian Haw during his decade-long protest. So as my fellow trainee hacks made their way into central London to track down the latest news, I crossed the road to Parliament Square and asked the chap in the hat and tent if I could have a word or two. I told him I was a journalist and he said I was the first to journalist to talk to him since he’d arrived. A coup for me and presumably he hoped it would get him some much needed publicity – unfortunately my assignment was read by precisely one person, my tutor. Nevertheless we chatted about what he was doing and why he was doing it. (Camping and protesting for peace in the Middle East, in case you were wondering). He also told me about his family – a wife and seven children – whom he had left in Worcestershire to embark on his campaign (he was divorced in 2003). And when I asked how long he would be living in his tent on the doorstep of Parliament he told me “as long as it takes”. I doubt he expected it to take the rest of his life. And in other news… This year we are a no longer going on vacation. Even staycations (http://en.wikipedia.org/wiki/Staycation) are out according to the Daily Express as the Squeezed Middle continues to be squeezed. Yes, next to important breaking news about the marital status of ‘Friend’ Jennifer Aniston, The Express reveals that some 18 million people can not afford a holiday – that’s a third of us (more if you include the inevitable children who cannot swan off to the Algarve without an accompanying adult). This news is relevant in my household because our own holiday is very much touch and go. And if it is ‘go’, then it is very much going to be in a tent and in this country. A family wedding means we will probably be able to tag on four days in the Lake District, surviving off bread and sniffit if we are lucky. From a first interview to a (possibly) last holiday in the space of a decade – it’s at times like this I wish I’d invested more of the £200 a week pay check from my first job. The last time the Squeezed Middle reared its head on Radio 4’s flagship morning news programme Ed Miliband found himself floundering for a definition. Now I’m no politician, but I know that if you are going to invent a new political bullseye to target, you should at least know what you are talking about. Ed’s efforts saw him define this new category of voters as pretty much everyone in the country – those earning over the national average wage as well as those earning less than the national average. As an aim for a politician hoping to win the next election it shows ambition – “let’s get everyone to vote for us”. Unfortunately as a concept it lacked a certain amount of detail and Ed and his new old Labour colleagues seemed to go cold on the idea. But it seems that it is about to make a resurgence – clearly this blog is largely responsible for the change in fortune in the Squeezed Middle concept. Literally tens of people a month are clicking on thesqueezedmiddleblog. Ed Balls and his team clearly know an opinion former when they see one and are not afraid of piggy backing on the wave of popularity already created by this blog. Except I have been left slightly perturbed by today’s re-classification of The Squeezed Middle. I appears that under the new definition I might not be covered by the term – it now seems that The Squeezed Middle are those people who are having to struggle with inflation while their tight-fisted bosses refuse to hand over a pay rise. Unfortunately for me and for this blog I was handed an increase just weeks after losing my job. The Job Seekers Allowance I am in receipt of was boosted by a couple of pounds in April. I now feel like a fraud. However, having taken legal advice I am going to stick with this blog – whether anyone else does is a different matter. So until I am sued by Ed Miliband for flouting the terms and conditions of the Squeezed Middle I will continue to view myself as part of it. If nothing else, my decision to stick with the initial definition will teach Ed and his advisers an important lesson about clarity. Being in a consultation period was a pretty meaningless state for me to be in. My job was deleted in the re-org and my job description was clearly designed to be so specific to me that it would be impossible to move to another post – even if there were any available. This was, after all, a serious re-organisation designed to save hundreds of thousands of pounds (more on that later). Now my job description and my job didn’t necessarily match up, but being new to the public sector I never realised how important this discrepancy could prove to be. So while I was never going to be able to save my job, it meant that I knew the outcome of the consultation period and could get on with planning for being part of the squeezed midddle. Despite my conviction that a new job was just round the corner there was nagging voice in my head that kept reminding me of some advice I had heard years ago. It came from a fun-loving grasshopper who spent the bountiful summer enjoying himself. While others around him were busy making preparations for a harsh winter, Mr Grasshopper played with his fiddle and most definitely did not collect acorns to sustain him over the harsh British winter. I, however, do live in a world where we are increasingly expected to do the hard work of preparing for hard times on our own. Which is why I felt like I was in a slightly better position than some of my colleagues when the cuts were revealed. Many were in a state limbo, but I knew I was a goner so was able to squirrel away some extra cash to help cover the mortgage in the unlikely event I wouldn’t get a job before the deadline rolled around. It could be seen as an admission that, even back then I was preparing to fail (in my job hunt), but as I sit here playing with my fiddle I’m relieved that I have some funds to fall back on. I’d been in my job for about three years when we were given the news that we were soon to be surplus to requirements. For about two and a half of those years I’d been looking for something else. It wasn’t just the red tape which wrapped itself around everything and everyone, stiffling any thought of innovation; or the ‘blowin in the wind’ management style that led to strategy after strategy falling by the wayside weeks after being proclaimed as the next big thing. It wasn’t even the fact I could do the job with my eyes closed. What I found really hard to cope with was all these things and more being part of the same organisation. So shortly after getting my feet under the desk I decided I’d rather like to leave – and back then it would have been on my own terms. I could have left with my gead held high, knowing I was moving on to bigger and better things. But as the punks nearly said – ‘Apathy rools OK’. So all my efforts to extricate myself from the job were somewhat underwhelming, consisting mainly of lazily emailed CVs to jobs I’d seen in the Guardian’s media section (online). The problem was although there was very little job satisfaction, the money was decent and it was fairly easy. The major problems arose on the rare occasions one of the ineffective managers realised they should actually be doing something. This usually involved micro-management to the Nth degree or sweeping generalisations that were impossible to interpret and which invariably led to something being done three times before it was changed back to the way I’d done it originally. Despite the fact my team were more or less all in the same boat – secretly on the look out for a new job – we all took pride in what we were doing and wanted to make the best of it. Largely we were successful, which allowed all those above us in the food chain to take credit for a job well done. And so while I joined with the intention of leaving after six months (the bare minimum for a CV) I was still there when the restructure was announced late last year – somewhat forcing my hand. The only problem was swinging cuts across the public sector meant I was now in a much more difficult job market. Looking for work when you are comfortable is never easy – unless you really hate your job you don’t have the motivation or the time. Filling in an application nowadays is a long drawn out process, and selling myself has never been a strong point of mine so it all feels a bit alien to me. Which all meant that once I actually did find myself out of work I got a rude awakening. Firstly I realised that the recent wave of redundancies meant I was no longer job hunting as a hobby, I was involved in a cut throat game with increasing numbers of players. Hundreds of people were now applying for the jobs I wanted (and now needed). I’m no expert in HR, but if I was on the receiving end of a few hundred CVs I’d shortlist from the first 20 and the last 20 (at best) – which means plenty will be filed straight under B for bin. No wonder so many jobs now come with the stipulation that you will only be contacted if you are successful in getting through to the interview stage – it’s not just the economy that’s gone down the pan, it’s common courtesy too. The problem with my current job of job hunting is that there is even less satisfaction to be had from it. The only time I’ll get any enjoyment out of it will be when I find a new job – and by then it will be too late because I’ll have to give it up in order to take up my new position as an active member of the employment market. Bins and lights – that sums up the Local Community Minister’s attitude to the public sector. So long as the first are emptied and the second are on Eric Pickles is a happy man. He doesn’t want local councils to be running huge self-promoting media campaigns, which is fair enough. However under his wish-list many more services would be stripped from councils’ list of responsibilities leaving a question mark over arts, sports and events that many local authorities currently promote. The logic behind the argument is that councils are there to do the bare minimum and all non-essential activities are a waste of money – and crucially that money is made up of tax-payers’ hard earned pounds. So the argument goes that cutting services will save the country money – hurray, no more deficit (apart from the one we have always had – http://www.newstatesman.com/uk-politics/2010/06/spending-cuts-canada-deficit). The problem is most councils are going to salami slice across the board rather than completely stop providing councillors’ pet projects or the type of non-services that middle class voters love like libraries, arts festivals and parks. In turn, that means essential services for the most vulnerable will inevitably see funding cuts. Unfortunately in a time when more and more people are joining the squeezed middle the Government is increasingly going to have to deliver the Lion’s share of local authority funding. It is not just individuals who will be squeezed – local services are also going to be squeezed. And that means politicians are going to try to cut budgets without anyone who votes noticing. Salami slicing will see the most vulnerable suffer while the more affluent in society barely notice any change. Fears over library closures will prompt them to take the kids to a Save our Books campaign one Saturday morning, but the reality is they are all hooked up to Broadband at home and so don’t actually use the library. They won’t notice that although the library has remained open it is only stocked with second hand Jeffrey Archer novels. The people who will notice salami slicing are the ones who rely on social care who see 20 per cent wiped off the budget for their services. Still at least the lights are on until midnight and the bins are emptied every fortnight or three weeks. For people with families to look after and mortgages to pay as well as those who enjoy eating food and living in rented accommodation, those are words you do not want to hear. There’s a lingering sense of insecurity around them – do you stick or twist? The ideal situation is for a review to look at everyone and come to the conclusion that there is nowhere within the department that can be cut; efficiency levels are at a maximum; and the Free World would collapse if just one admin assistant was lost. But in the environs of public sector communications departments that is never going to be the case. So when you are told that your job is under review you know there is a fairly high chance of it being reviewed out of existence. It has been impossible to avoid the hints from Government that the public sector would be hit hard under the austerity plans from the Coalition Government. Reducing public spending has a two-fold effect – both positives for the Government. 2. It creates widespread worklessness a ready band of willing and skilled volunteers to help put the Big Society into place. But before this new volunteer workforce can be created there needs to be some streamlining. Volunteers are no good to anyone if they have to hold down a 9-5 job to help pay the bills. Telling someone they may soon be looking for work can’t be easy for anyone – which is probably why the issue was handed over to the HR team. A specialist crew who have been highly trained to avoid any emotion in such matters. Having politely declined to do the dirty deed themselves, senior mangers were keen to be seen to be doing something. Missives were sent out and promises were made that they would be there for us and would do all they could to help us through it. And behind the scenes, the powers-that-be had been putting together an event that would be a helping hand for anyone who was facing an uncertain future – or to put it another way, everyone who wasn’t in the Department Head’s clique. It’s easy to sneer about this type of event before you actually attend one and see what has been laid on in terms of practical advice and help for people facing the grim prospect of losing their job. And after having been to one it was even easier to sneer. As a bare minimum I would have expected advice on how to spruce up my skills and knock my CV into shape. What would have been really useful is a bunch of representatives from employment agencies looking to cash in on a potential goldmine of 100s of trained workers who would soon be desperate for work. What we got was advice on how to make a fruit smoothie, the citizens advice bureau, a stall encouraging people to get active to avoid depression and heart disease; and a few leaflets on pensions and financial planning. If I hadn’t been told otherwise I would have guessed that this event was the long-planned employee well-being fair with a few leaflets on pensions and financial planning thrown in. But no, this was the spoonful of sugar to help the medicine go down. The feeling that it had been hastily re-branded to fit the current climate was hard to avoid, but I did get something out of it. I signed up for a pedometer hoping that a bit of walking would keep me active and stave off depression – plus it’s cheaper than the bus and I have a feeling that every penny is going to count soon.